A new year is underway—a time to start fresh with all the things we want to accomplish. So many of us start out in January with the number-one goal of getting back in shape and becoming healthier versions of ourselves. The process is easy to start. It’s new, we’re excited and motivated, and everything seems so clear; however, starting is not the problem. The struggle comes in following through and finishing what we’ve started. As we move along in our journey, we often find ourselves slacking off, procrastinating, or just losing our motivation. Many people fail to be consistent and accomplish their goals because they bite off more than they can chew, meaning their goals are too high and too broad. When they realize they’re having a hard time, they start to doubt themselves, and disappointment sets in, leading them to stop doing the things they need to do in order to succeed. Midway through the year, they give up, and the vicious cycle begins again as they start waiting for the New Year, when they’re finally going to get in shape. Sound familiar? The key to avoiding that pattern is to set realistic goals and make a plan to carry them out—and by make a plan, I mean write it out. That way you are able to see on paper what you need to do. It keeps you focused and allocating your time and resources efficiently. When I was getting my MBA in marketing, I learned the acronym SMART, which stands for specific, measurable, achievable, realistic or relevant, and time. I applied it to my studies and in my everyday life, and believe me, it’s the perfect system for breaking down the steps you need to take to reach your goals. Basically, in order to accomplish anything, you have to set specific goals that are measurable, easily achievable, relevant to what is going on in your life, and realistic for the time period you have given yourself. How will you measure your progress? Will you go by the scale or tape measure or have your body fat percentage taken? Your choice will have a lot to do with the specific goal you’ve set. For the goal of losing 30 pounds and five inches, a scale and tape measure will enable you to track your progress and know when you have reached it. You’d be crazy to think that you can lose 10 pounds in a week. That goal is not achievable—or at least not achievable safely. If you say, “I want to lose one to three pounds a week” now, that is doable. It’s good to aim high, but don’t go for the stratosphere. On the flipside, if your goal is too easy, it won’t be motivating. Is It Realistic and Relevant to your life, currently? Also affecting whether a goal is achievable is if it is realistic for your life. Let’s say you weigh 200 pounds, and you want to be 150 in four weeks. That would not be achievable in any event, but a goal of 50 pounds in six months is more realistic—if the effort it will take to get there fits where you are in your life right now. Don’t set a goal that someone else is pressuring you to do. Look at your current situation. Are you able to focus and remain committed and consistent? For example, maybe you’ve started a new job and are going to be traveling. In that case, it may not be a good time to focus on weight loss. What’s your timeframe, your deadline—when do you want reach your goal? When setting your deadline, remember to be realistic about what you can do in that length of time and take into consideration who you are and how you operate. Write down your goal, and put it somewhere that you will see it as a daily reminder. I keep mine in my planner, because every morning I look through my planner to see what I have going on for the day. I never miss seeing that piece of paper. I will walk for 45 minutes 3 or 4 days every week. I will drink at least a gallon of water per day, every day. I will portion my meals and bring them with me so I have no excuses for buying unhealthful food. After you have achieved your action goals, check them off the list, and move on to a more challenging set of action goals. Do that weekly, monthly or even daily, making the action goals ever more challenging. As they say, failing to plan is planning to fail. Try my SMART strategy, and do things right the first time. 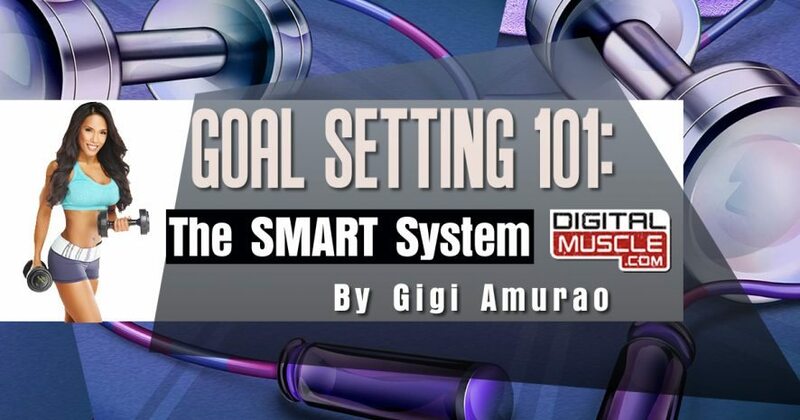 Check out more from Gigi at her blog right here at DigitalMuscle.com!